Despite John Stuart Mill's widely respected contributions to philosophy and political economy, his work on political philosophy has received a much more mixed response. Some critics have even charged that Mill's liberalism was part of a political project to restrain, rather than foster, democracy. Nadia Urbinati argues here that this claim misrepresented Mill's thinking. 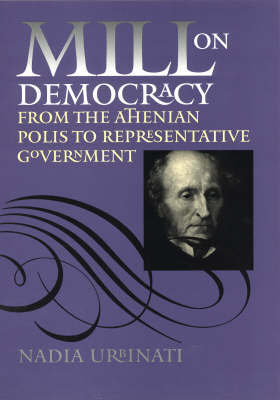 Although he did not elaborate a theory of democracy, Mill did devise new avenues of democratic participation in government. Drawing on his often overlooked writings on ancient Greece, Urbinati shows that Mill saw the ideal representative government as a "polis of the moderns", a metamorphosis of the most unique features of the Athenian polis - especially its deliberative character and its Socratic ethos of the sovereignty of individual judgement. Urbinati concludes by demonstrating the importance of Mill's deliberative model of politics to his theory of political liberty and to the contemporary debate on liberal and republican views of liberty. Urbinati's fresh and persuasive approach not only clarifies Mill's political ideas, but also illuminates how they can help enrich our contemporary understanding of democracy.